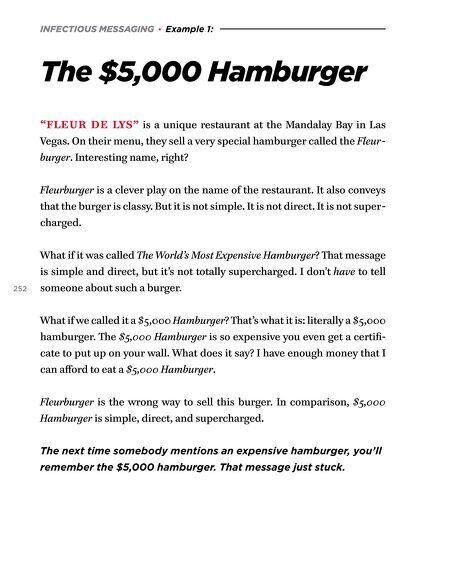 INFECTIOUS MESSAGING · Example 1: The $5,000 Hamburger "FLEUR DE LYS" is a unique restaurant at the Mandalay Bay in Las Vegas. On their menu, they sell a very special hamburger called the Fleur- burger. Interesting name, right? Fleurburger is a clever play on the name of the restaurant. It also conveys that the burger is classy. But it is not simple. It is not direct. It is not super- charged. 252 What if it was called The World's Most Expensive Hamburger? That message is simple and direct, but it's not totally supercharged. I don't have to tell someone about such a burger. What if we called it a $5,000 Hamburger? That's what it is: literally a $5,000 hamburger. The $5,000 Hamburger is so expensive you even get a certifi- cate to put up on your wall. What does it say? I have enough money that I can afford to eat a $5,000 Hamburger. Fleurburger is the wrong way to sell this burger. 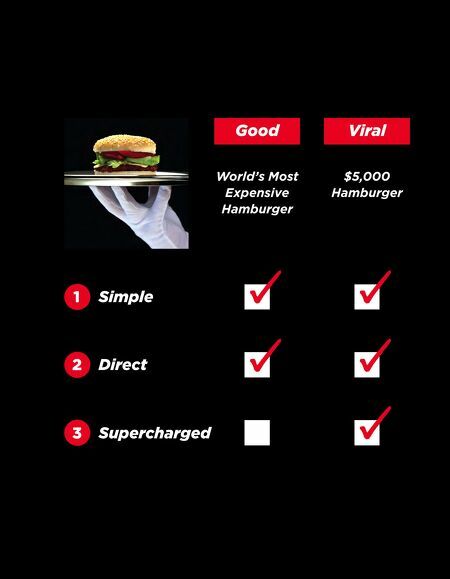 In comparison, $5,000 Hamburger is simple, direct, and supercharged. The next time somebody mentions an expensive hamburger, you'll remember the $5,000 hamburger. That message just stuck.